Nintendo Labo aims to boost the development of skills such as creativity, collaboration, critical thinking, and problem-solving. In addition to introducing children in a fun way to explore essential topics of STEAM. Nintendo and the nonprofit Institute of Play (IOP) will integrate Nintendo Labo into the curriculum of 100 US schools. The goal is to encourage children to explore, play, solve problems and get excited about design and technology. Nintendo Labo is a kit of cardboard pieces with which kids can build vehicles, musical instruments, robots or tools that “come to life” combined with a Nintendo Switch console. This learning game-based experience begins with the construction of a cardboard accessory, which can be customized with prints or designs, and finally works as an interactive game device that responds to movements or instructions in a touchscreen. For Nintendo developers, this activity supports the development of skills such as creativity, collaboration, critical thinking and problem-solving in kids. In addition to introducing children in a fun way to explore essential topics of STEAM (science, technology, engineering, art, and mathematics). To shape the curriculum, the IOP brought together an interdisciplinary team of educators, researchers, game designers, and school leaders. “We are always on the lookout for new tools and technologies that combine the best of learning with the spirit of play, and in Nintendo Labo, we found an inspiring and innovative approach in both areas. 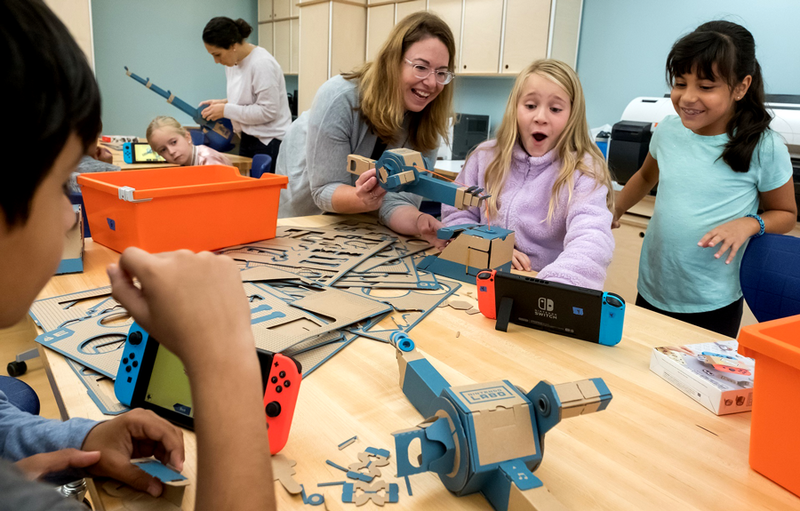 (…) Teachers in the pilot program are already seeing the natural fit for Nintendo Labo in the classroom, and now we can bring that dynamic to schools across the country,” stated Arana Shapiro, Co-Executive Director of the Institute of Play. The IOP will develop a guide for teachers of Nintendo Labo that will include examples of lessons and learning modules dedicated to teaching essential elements of STEAM. This guide will be available for free by the end of this fall for anyone who wants to incorporate Nintendo Labo in classrooms or at home.